WAYNE, PA--(Marketwired - Dec 1, 2016) - Elemica, the leading Supply Chain Operating Network for the process industries, discusses a top supply chain agenda that companies should focus on in 2017 -- stopping problems before they happen through end-to-end visibility. Industry analyst firm Gartner defines end-to-end supply chain visibility as "controlled access and transparency to accurate, timely and complete events and data -- transactions, content, and relevant supply chain information -- within and across organizations and services operating supply chains." In other words, customers want to know, "Where's my stuff?" Emerging next-gen end-to-end visibility applications in concert with a network of interconnected buyers, suppliers and logistics providers are enabling companies to lower working capital and operating expenses, mitigate risk and improve customer satisfaction. "Industrial process manufacturers tend to focus their supply chains on their manufacturing processes of optimizing asset utilization, productivity and Return on Assets," said Rich Katz, Chief Technology Officer at Elemica. "For success in the New Year and beyond, process industry leaders will extend their focus beyond their four walls -- and center their supply chains more on their customers. To do this well, companies need timely and accurate insights gained from visibility up and down their extended global supply chains." Think beyond simply seeing information -- know how to analyze it and take appropriate action across the extended enterprise, and use predictive analytics to support visibility goals. According to industry analyst group, Gartner, end-to-end supply chain visibility will increase by 50 percent by 2018. This growth in end-to-end supply chain visibility provides significant benefits, such as higher order fulfillment rates, improved customer service levels, higher profitability, increased operational efficiency and higher revenue growth. 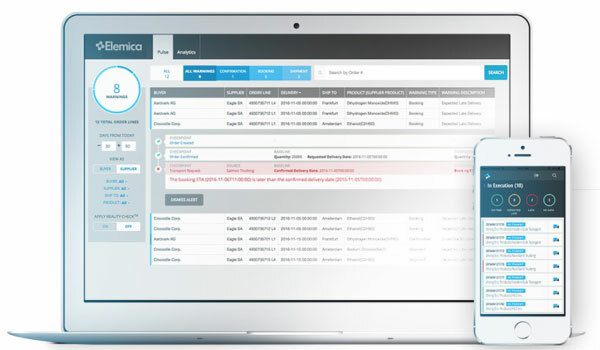 Using a supply chain operating network like Elemica's, that offers collaboration and visibility capabilities, helps enterprises to experience better on-time performance, reduce variability in lead times and free up working capital.